Messaging apps have grown astronomically over the past few years. Facebook-owned WhatsApp (which was founded in 2009) and Facebook Messenger (which the social media giant first launched in 2011) both hit the 1 billion mark in monthly active users in 2016. The Chinese app WeChat (which also launched in 2011) did the same in 2018. With the continued proliferation of mobile devices, messaging apps like these are not likely to go away—or even show any signs of decline—anytime soon. There are literally hundreds of these types of services in existence around the world, and if companies want to be able to meet consumers in their preferred channels—and very few companies today can afford not to—they would do well to incorporate messaging apps into their strategies. This is particularly true in the customer service arena, where ease of communication is essential so as to not further inflame already frustrated customers. Messaging apps are a must-have channel for customer support in the digital era, experts say. “Customers want convenience, and they’ll give their loyalty to brands that provide it. There aren’t a lot of people who want to pause their day to wait on hold with customer support. Customers want those interactions to happen anytime, anywhere, and usually they want to be able to handle them discreetly, at their fingertips,” says Robert Vis, CEO and cofounder of MessageBird, a cloud communications platform provider. “Using messaging apps for customer support makes sense because they fit into our busy digital lives. That’s because messaging apps offer more than just messaging: You can send videos, links, photos, and even money. In a customer support setting, all of that translates to context. Instead of trying to decipher what a customer wants, the customer can show you exactly what he needs all in one thread, and if you ever need to pick up the conversation again, it’s there waiting for you all in one spot,” he adds. As the world continues to become more mobile, companies “don’t want to interrupt customers’ lives. They want to fit in seamlessly as their customers live their lives. That’s why offering customer support through messaging is a smart move,” Vis concludes. The big tech giants have already taken steps to make messaging more accessible for companies. Facebook, for example, opened up its Messenger app for developers and businesses in 2015, and Apple followed suit in 2017 when it introduced Business Chat, a platform that allows companies to communicate with customers via its iMessage service. Moves such as these set the precedent for communication between companies and consumers via messaging apps. Modern messaging apps provide customers with a single channel for all of their interactions with a company and give them a great degree of control over those interactions, Bell adds. “Customers are able to quickly start conversations…to buy products, schedule appointments, or troubleshoot problems, all in a single thread. Consumers can respond to a company on their own time, whether that’s two minutes or two days later, with the expectation that the company will pick up the inquiry where it left off in the thread. This effectively puts the consumer in the driver’s seat,” he says. Because of the immense popularity of WeChat—the multipurpose messaging, social media, and mobile payment app developed by Tencent—the notion of using messaging apps to communicate with companies has been led by China. 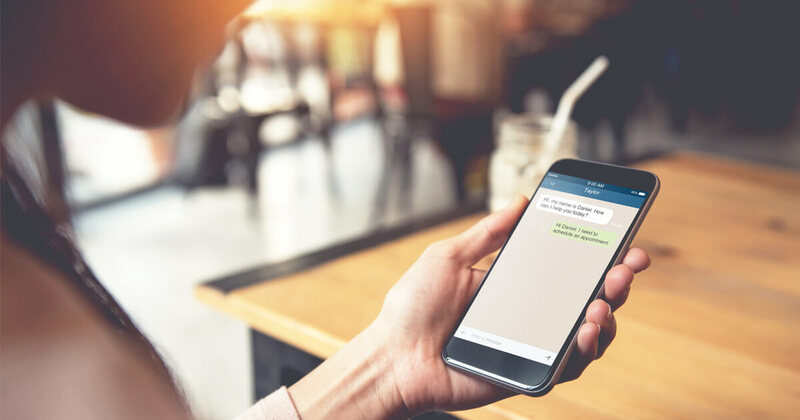 “In places like China, where mobile commerce is more popular, messaging as a form of customer support is more widely available—if not the expectation,” says Fabrice Martin, chief product officer at Clarabridge, a customer experience management software provider.